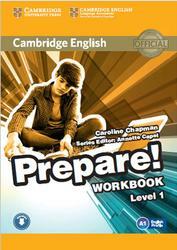 Prepare, Workbook, Level 1, Chapman C., 2015. 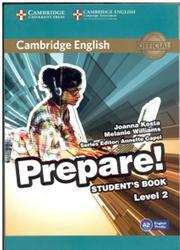 Development of this publication has made use of the Cambridge English Corpus, a multi-billion word collection of spoken and written English. 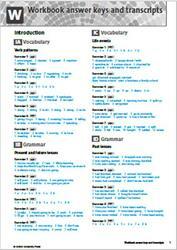 It includes the Cambridge Learner Corpus, a unique collection of candidate exam answers. 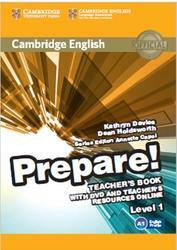 Cambridge University Press has built up the Cambridge English Corpus to provide evidence about language use that helps to produce better language teaching materials. 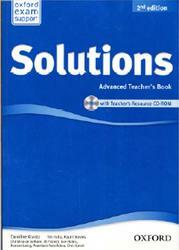 Solutions, Advanced Teacher's Book, Falla T., Davies P.A., Krantz C., 2013. Encourage students to record new words in a notebook. They can group words according to the topic or by part of speech. Tell them to write a translation and an example sentence that shows the word in context. Vocabulary does not just appear on Vocabulary pages. You can ask students to make a list of all the verbs that appear in a Grammar section, or to choose five useful words from a reading or culture text and learn them. 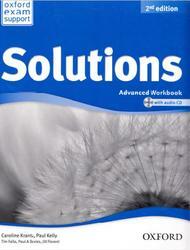 Solutions, Advanced Workbook, Falla T., Davies P.A., Kelly P., Krantz C., 2013. There was once a wolf who used to wander out every night in search of a lamb for his dinner. But recently this wolf has been having difficulty getting enough to eat because the shepherds in the area were particularly vigilant. One day he was coming across a sheep’s fleece which a sheep shearer had been throwing on the floor and forgotten. It had given the wolf a cunning idea. He decided that later he is going to put on the fleece. Thus disguised he would be able to sneak up on the sheep without the shepherd noticing him. So that evening, just as the sun had been setting he went out in his new disguise. He was strolling confidently into a field where some sheep grazed. 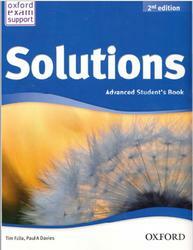 Solutions, Advanced Student's Book, Falla T., Davies P.A., 2013. Spirituals are religious folk songs that were created by black slaves in the USA in the eighteenth and nineteenth centuries. The slaves were converted to Christianity, and the songs were an expression of their religious faith and also communicated the hardship and suffering they endured. Black gospel music has its roots in spiritual music, originating in churches in northern cities in the 1920s. It has survived as the most important music in churches with predominantly black congregations. Solutions Upper-Intermediate, Workbook answer keys and transcripts, 2017. Kevin is very quick to think negative things about people. Even when he talks about his best friend, he always tells you about his faults. And if somebody hasn’t got any faults, he invents them, so you can’t always believe what he says. 2 Olivia can’t go past a mirror without looking at herself in it. She always worries about her appearance. I was in town with her the other day and she spent the whole time looking at her own reflection in the shop windows!